Jake Noble is Managing Director in CIBC’s Commercial Real Estate group. He leads a team responsible for executing CIBC’s relationship banking strategy with dynamic and growing middle market companies in the commercial real estate industry. His direct responsibilities include business development and relationship management, generating new commercial real estate relationships and identifying opportunities to expand existing banking relationships with clients. Prior to joining The PrivateBank in October 2007, Mr. Noble was a Vice President in the Illinois Commercial Real Estate division with LaSalle Bank. He was responsible for managing relationships with Illinois-based commercial real estate firms and growing a loan portfolio in excess of $300 million. Mr. Noble completed the Commercial Lender Training Program at LaSalle in 2002. 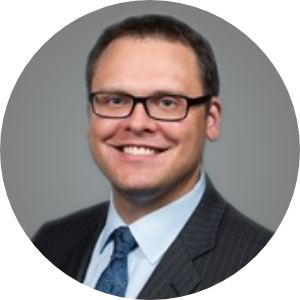 Jake has been involved with Midtown Educational Foundation in a variety of capacities for over 10 years and currently serves on the Midtown Advancement Council board. He lives in Evanston with his wife, Kate, and their two sons. Jake and Kate are active in their local parish, Saint Joan of Arc, and with special education advocacy for kids on the Autism spectrum.